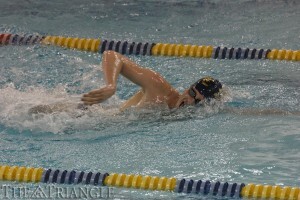 The Drexel men’s swimming and diving team defeated Loyola University Maryland, Lafayette College and Seton Hall University in a group meet Oct. 26. Up next for the Dragons is a head-to-head matchup with George Washington University Nov. 2 at Drexel Pool. The Drexel swimming and diving teams traveled to Baltimore to take on Loyola University Maryland, Lafayette College and Seton Hall University Oct. 26. The men’s team conquered the meet with wins against all three opponents to remain undefeated for the season; they beat Loyola 196-103, Lafayette 208-90 and Seton Hall 207-89. The women also brought their best to Baltimore, capturing two wins against Lafayette (212-88) and Seton Hall (163-136) and just falling short to Loyola (137-163) in a highly competitive contest. The Dragons started off the meet by running away from the rest of the competition in the 200-yard medley relays. For the women, Katie Duggan, Rachel Bernhardt, Emily Lau and Brianna Bentz touched the wall at 1:47.52. For the men, Joel Berryman, Chad Schmidt, Kyle Lukens and Alex Bagshaw took the win with a time of 1:34.79. One of the biggest surprises of the event was the performance from the underclassmen. Maura Brennan won the 1000 free as well as the 500 free against Lafayette. Zoltan Gercsak stunned his opponents as he raced past them in the 1000 free and 500 free, winning every race against all three teams. Also, Claudia Duguay won the 50 free in all three meets, Clark Hou won the 200 individual medley, and Rachel Bernhardt took home wins in the 100 breaststroke and 200 breaststroke. “We had a number of freshmen get their first wins for Drexel,” head coach Shawn Markey said. In Bernhardt’s debut appearance as a Dragon, she recorded a time of 1:05.43 in the 100-yard breast stroke, which broke the past record of 1:05.64 that was held for 16 years. She also now sits in third all time for the Drexel women’s 200 breaststroke with her winning time of 2:24.57. The diving team also executed very well. On the first day of competition, the Dragons made it clear that they were a force to be reckoned with. Sophomores David Sanchez and Madison Kramer led the way for the Dragons and didn’t seem to show any signs of slowing down by the end of the meet. Collectively, the two won every event they competed in, picking up a total of four wins for the Dragons. Kramer was just one point away from qualifying for the NCAA diving zones meet in the one-meter. But it’s only November, and she will have other chances in coming weeks. With all of the newly discovered young talent on the team, fans can expect that this year will have some exciting moments, and some other records may be on the verge of being broken. When asked about his up-and-coming squad, Markey discussed some of the team’s potential and the expected future of the program. The Dragons will return to the water Nov. 2 when they host George Washington University at 1 p.m. It will be interesting to see if the Dragons can continue on their path of dominance against a very tough opponent.